Ambulances are already built to be tough and fast, but they definitely weren’t meant for off-road conditions. 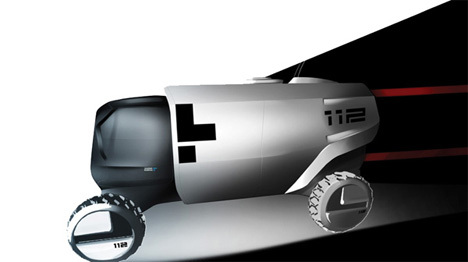 The RT 112, designed by Tomasz Siemek, is an altogether new type of emergency vehicle. It’s part off-roader, part armored car, and all customizable modular emergency response vehicle. The remarkable thing about the RT 112 is not so much the technology it would use; the remarkable thing is the way existing technology would be put together in this vehicle. Off-road suspension and a polycarbonate Makrolon shell make this the kind of vehicle you would want to be in if you were ever unfortunate enough to need a ride in an ambulance. A telescoping light would provide plenty of illumination all around the vehicle, promoting safety and aiding in search and rescue efforts. The tough truck would make it possible for rescuers to get close to victims in remote locations or tough terrain. Currently, ambulances have to park far away and rescue personnel have to reach the victims on foot, then transport them back to the vehicle. 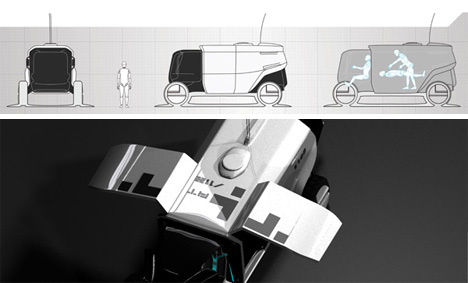 The rear part of the vehicle is contains elements that can easily be changed to suit the particular rescue situation for which it is needed. Different configurations can be used for operations in different parts of the world, making this a truly global rescue tool.